Taking exams is like wiping your bottom. It’s not the point of the exercise, but it’s a very important part of the process. In my last blog, I listed a few errors are almost guaranteed to make us teachers scream. In this blog, I’ll explain how students can avoid the errors and even how they can write such impressive answers that an examiner won’t be able to resist giving them top marks. Again, I would positively encourage you to share this with your students. In my last blog, I explained why you should only write “In this case study, …” if you are certain that the research isn’t one of the other types of research used by psychologists. Test yourself; which of these are case studies? Bickman’s study of passers-by obeying a stooge in normal clothes or a uniform. Milner’s study of HM, a man whose memory was affected by brain damage. Bagby’s study of classical conditioning of a phobia in a woman trapped in rocks. Ainsworth’s studies of children’s attachment behaviours in the strange situation. The bluffer’s way to avoid this error is simply to avoid the problem and use a general phrase like, “In a key study, …” or “In this research, …”. Students who have taken the time to learn the difference between the different types of research can give their teachers a little relief and earn themselves a gentle appreciative nod by naming the correct type of research; “In this experiment, …” or “In this meta-study,…”. At this point, the best students will have noted that some studies are hard to classify. Is Asch’s research on conformity really an experiment as there is no independent variable? Is Watson and Rayner’s study of Little Albert an experiment because there is an independent variable or a case study because there was only one child? Is Bandura’s research with the Bobo doll an observation because he measured behavioural categories or an experiment because there is an independent variable? Impress your teachers by discussing this with them. Other students might be wondering whether they need to remember all those names. Psychologists use the names and dates of studies because it’s a quick way of sharing a lot of information. It’s much easier to say “In Miller (1956),” than to describe the whole study. At A Level, naming the studies gives the examiner confidence that you are thinking like a psychologist, but it is not essential. The worst thing you can do is name a researcher, then describe research by someone else – especially, if the research is one of the key studies named on your specification. In the last blog, I explained why you should always include titles and labels on your graphs. In most cases, if you are asked to draw a graph, everything you need will be given to you in a table in the question. Because the teachers or examiners are good scientists, they will have completed that table accurately using the correct labels and title. This means that in most cases, all you need to do is copy the label and title from the table to your chart to get full marks. “There is a significant difference in scores between Condition A and Condition B” is not a good hypothesis because it could refer to any study in which something is measured and there are two conditions. 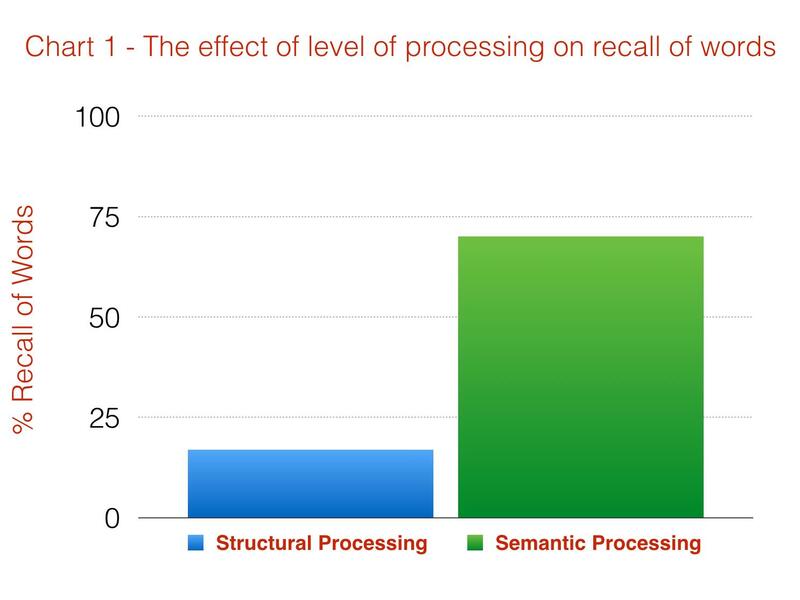 “There is a significant difference in % recall of words between the structural processing condition and the semantic processing condition” is much better. At this point, if you are wondering what structural processing and semantic processing are, the first thing to observe is that you don’t need to know in order to draw a good graph or write a good hypothesis; you simply need to use the same terms that were used in any stem material you were given. But, as you are interested, they are terms used to describe different ways of learning material and the chart above shows the results from a classic study by Craik and Tulving (1975) — it’s worth reading more about the concept of levels of processing because it has the potential to change the way you think about revision for your exams. Always use titles and labels – they are in the question for a reason. In my last blog, I explained that you should never write, “this proves…” because proof is a logical concept, not a scientific one. The problem is that scientists are human, and we are all prone to confirmation bias — the bias to favour evidence that supports our prejudices and ignore evidence that contradicts them. Karl Popper demonstrated that it didn’t matter how much evidence there was for a theory, there was always the possibility that other evidence would disprove it. He argued that good scientists looked for evidence to contradict a theory, because if they looked for evidence to support it, they are likely to ignore contradictory evidence or provide reasons why it should not count. If you want to find out more about Popper and falsification, this video gives a neat explanation of Popper’s argument about Marxism — and you can read his original paper online. He was particularly critical of Freud’s theory because concepts like the id, ego and superego are impossible to test and the defence mechanism of reaction formation means that his theory can explain any outcome of a fixation retrospectively. In my last blog, I explained that there are lots of different types of validity and you should be careful before writing a reflex criticism that any research lack ecological validity. It is simply a judgement about whether a study has truly studied what it set out to study. The validity of most studies can be questioned in one way or another, but the problem is not always their ecological validity. If you are going to criticise the validity of a study, it’s important to explain exactly why it lacks validity. Although many studies do lack ecological validity, at least as many lack temporal or cultural validity because of the time and place in which they were conducted or there is some bias in the sample such as that all the participants were all students or all male. None of these have anything to do with the ecological validity of the study, but they have very important implications for the validity. If you are certain of the name of the specific type of validity that you are commenting on, use it. Otherwise, don’t just write ecological validity and hope it’s right. And if you are going to comment on the validity of a study, it’s even more important to explain what the lack of validity implies for the theory that the research is testing. If you can suggest that the validity of almost every study could be improved, it’s important to think about the specific implication of the lack of validity in a specific study if you want to be credited for it in an exam.